This article aims to review a number of workplace-related election promises made to date by the three main parties. That said, this is by no means a comprehensive list of all party policies with respect to the workplace – rather, we have just highlighted a few of particular interest. For those interested, access to all three parties’ platforms can be found here. As readers of this blog are likely aware, the majority of Canadians are governed by provincial employment laws. As such, the NDP minimum wage has been criticized by some as promising Canadians something that would only apply to a small minority. Indeed, only about 6 percent of Canadians have their employment governed by the Canada Labour Code (the “Code”), which the federal government controls. Moreover, while the ‘Fight for 15’ movement seeking fair wages has largely been targeted at the service industry (think McDonald’s and Burger King) such employers in Canada are provincially regulated. Thus, a federal $15 dollar minimum wage would not apply to vulnerable workers in this sector. Despite these problems, this is not to say that the NDP plan does not have merit. 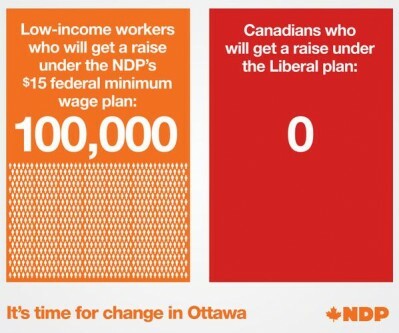 As the party itself aptly displayed on Twitter, the federal minimum wage would certainly impact a number of Canadians. Leading by example, we will amend the Canada Labour Code to provide every federally regulated worker with the legal right to make a formal request to their employer – without fear of reprisal – for more flexible working conditions, such as flexible start and finish times, or the ability to work from home. To begin, it needs to be pointed out that even without the proposed amendments to the Code, there is nothing at present to stop employees from asking their employers to consider flex time arrangements. The Liberal policy merely formalizes the process. The most substantive change is the addition of reprisal protection for those who make requests. This is certainly a welcome and important aspect of the policy. As a practical point, however, it is often exceedingly difficult for employees to prove reprisal claims. One measure by which the Liberals could further strengthen their anti-reprisal provision would be to consider putting a reverse onus on employers similar to that found in Ontario’s Occupational Health and Safety Act. Perhaps the most important critique of the Liberals’ flex time policy is the potential it has for creating additional red tape. Most employers are already overburden with regulations and requirements. The Liberal Flex Time policy would only add to this problem. A quick look at the source for the Liberals’ Flex Time policy, a similar law in the United Kingdom, demonstrates how onerous the Flex Time policy may be in operation. Under the UK version, employers must ensure all requests are made in writing, are dealt with within 3 months and offer an appeals process. That will certainly take more time and money than the current system where workers simply speak to their employers directly. All three major parties have put forward proposed changes to Employment Insurance (“EI”) and Parental Leave. The NDP has promised to provide 5 additional weeks of paid parental leave, on top of the current 35 weeks. By contrast, both the Conservatives and Liberals have promised to allow for an increase of federal job protection for new parents from 12 to 18 months. The catch? While your job is protected for the additional time, EI benefits will not be provided at 100 percent over the 18 month period. Rather, the regular 12 months of benefits can merely be extended over the full 18 months at a reduced rate. The longer the maternity leave, the higher the likelihood that women will not return to paid work at all or will return on a part-time basis. No matter which party forms the next government after October 19th, one thing is clear – changes are coming at the federal level to Canadian workplaces. Hopefully this brief guide helps those trying to determine the merits of the various party platforms. Happy voting! Thanks for your question. The quote you refer to was made by Professor Kathleen Lahey in her interview with MacLean’s. She only mentions that this conclusion is based on “numerous studies.” I suspect she didn’t get into details given the nature of the interview. If you are interested in the subject, I would encourage you to reach out to Professor Lahey directly. From her CV, it is clear she had done extensive research into the subject matter. Could I ask for the source of the statement in the final box of this article regarding return to work rates being higher when mat leaves are longer? Is it a comment or opinion or is there some data that support this? For example, after changes to federal EI rules a few years back to give women a full year of mat leave, did their RTW rates decrease compared to the decades before? My research of literature seems to support the RTW rates change based on complex interactions between a number of factors including professional training/field, workplace culture, workplace flexibility and even how many other mothers of young children worked in the same location (suggesting that informal supports was a factor in RTW rates). Thanks.